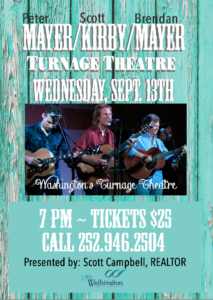 The trio of Peter Mayer, Scott Kirby, and Brendan Mayer will make a stop on their tour in little Washington at the historic Turnage Theatre. The three will perform their blend of acoustic folk with a hint of tropical tunes for an excited audience. Tickets can be purchased by calling 252.946.2504 or visiting the Turnage Theatre/Arts of the Pamlico online at www.ArtsofthePamlico.org. The Saturday Farmers’ Market brings more variety as fall approaches. Visit the Farmers’ Market on the corner of Bonner and Water Streets in downtown Washington every Saturday from 8A-Noon. And, call now to make a reservation for River Roving, one of the best FREE opportunities found in Washington. 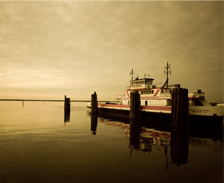 The NC Estuarium staff and volunteers will take you on a river cruise along the Pamlico and Tar Rivers. Reservations can be made by calling 252.948.0000. Don’t miss Pamlico Sounds with Arts of the Pamlico on Sept. 22. This FREE event features music and entertainment for all ages. CLiCK HERE for the complete listing of September events. Arts of the Pamlico will kick off the Marquee on Main Film Festival with a showcased film and continue through the weekend showing professional, amateur and student movies and documentaries. Blues & jazz in the gallery before the opening starts at 6:30pm. 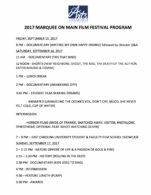 Films shown on a Saturday from 11-6pm and on Sunday 2-4pm ending with awards. Enjoy a night of Pamlico River blue crabs on the waterfront at Washington’s Festival Park. This is an annual fundraising event for the Washington Harbor District Alliance. Please note the date has been changed from September 9th to September 23rd. For tickets call 252.947.1487. The July-December 2017 calendars are available now in print. Email visitus@littlewashingtonnc.com or call 252.948.9415 ext. 3 to receive your copy. Be sure to check our online calendar for an up to date calendar of events.